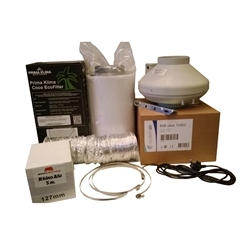 The Rhino Extraction Kit contains everything you need to extract air from your grow room. Included in each kit is: an RVK Fan; a Rhino Pro Carbon Filter; 5m of Aluminium Ducting; 3x Jubilee Clips; and an RVK Power Lead. 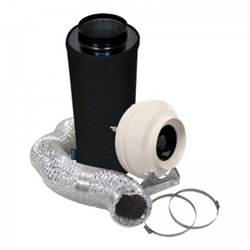 An extraction system usually comprises of an extraction fan and a carbon filter. 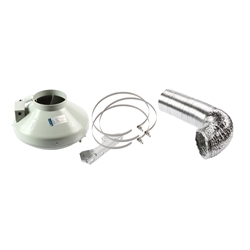 It is used to extract stale air from your grow room, helping to ensure that there is a constant supply of fresh air for your plants. 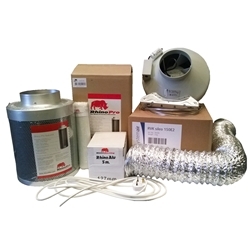 An extraction kit will also help to reduce temperatures in your room by removing hot air and, when used with a carbon filter, will help remove any smells too! On this page you will find a range of options for extracting air from your room - there are options for all sizes of grow space and budgets. If you require any further assistance then please do not hesitate to contact us via email, over the phone or at our central South West London store.